This past weekend was Mother’s Day, and we had a particularly good one. My Mum’s birthday always falls pretty close to Mother’s Day, and this year was her 65th. My big sister Sara threw a surprise party for her and had all of her children and grandchildren (7 of one, 20 of the other) plus most of the kids-in-law there. It was awesome to have everybody together for the day. 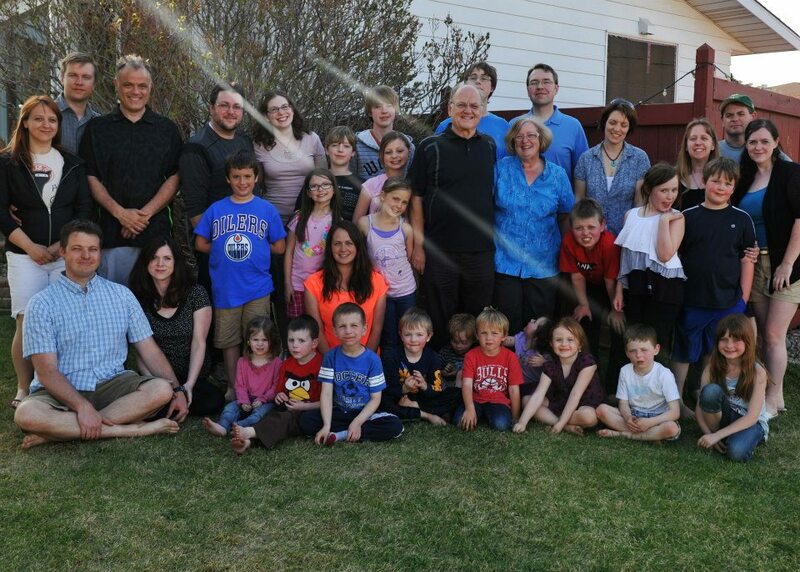 Mum and Dad with all 7 kids, 6 of the spouses (B-I-L Greg couldn’t make it), and 20 grandkids. I brought a salad to the party, as per my assignment. It was a variation on the salad I’m going to post today. I’ve fine-tuned it and improved it after feeding it to the masses. I was watching my sister Amy eat the salad, waiting to see how she reacted to it. “I don’t usually like tomatoes,” she explained, “but these ones are delicious!” Uh…that’s because it’s watermelon, not tomato. Watermelon IS delicious, though! I’m giving measurements, but you really don’t need to measure anything. It’s a salad. Just throw whatever looks good in a bowl. Omit the feta if you’re strictly paleo. The feta’s really good, though. If you’re into it. Start by slicing your red onion and add it to your salad bowl along with the lemon juice (let this sit for a bit). 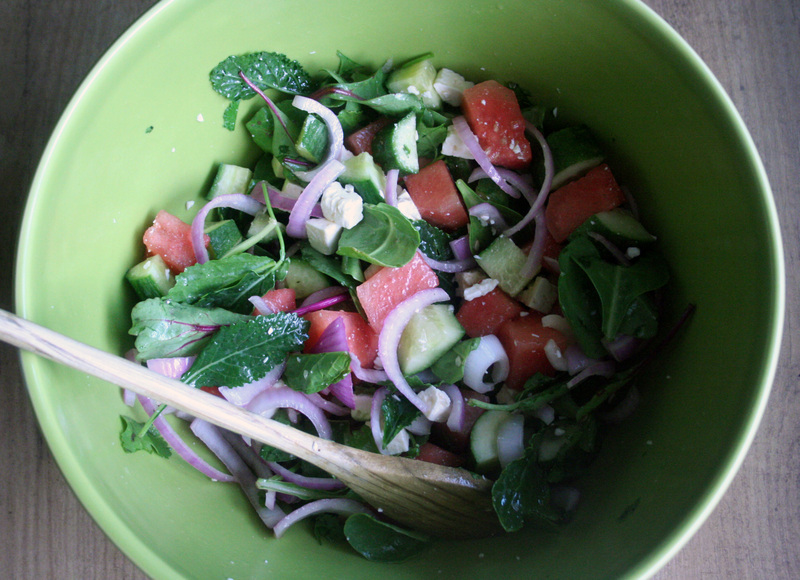 Chop up your watermelon and cucumber and add them to the bowl, then add the rest of your ingredients. Drizzle with olive oil and toss. Makes 4 generous side dishes or starter salads. Scales up easily to feed a crowd! 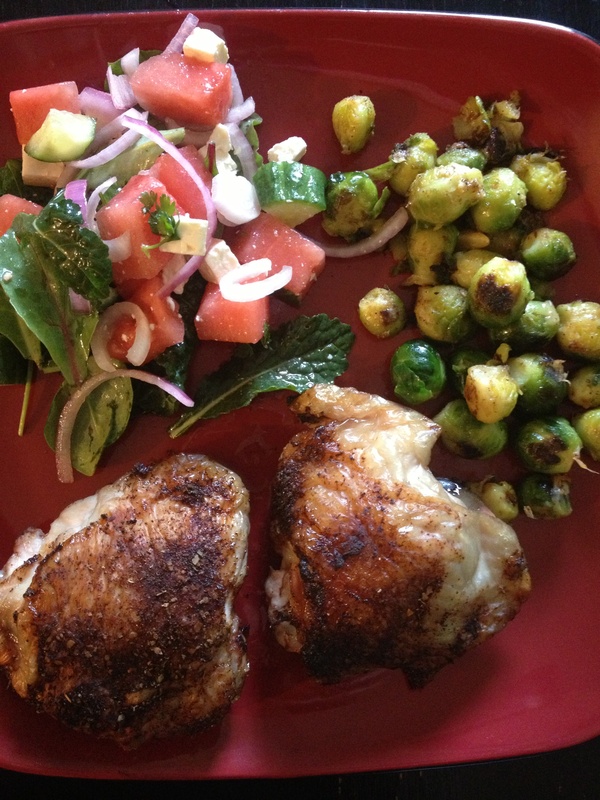 We had it with BBQ chicken thighs and brussels sprouts. Mmmm.